Edgar Lungu has up to now not appointed the Public Protector because he is scared of appointing an Independent Person because of rampant abuses under his watch. 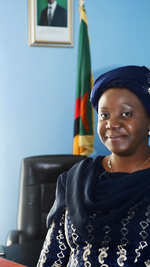 Ministry of Justice officials have disclosed that though the Office of the Public Protector was established in 2016, Lungu has not appointed anyone as Caroline Sokoni has just been acting. ” We do not have a Public Protector. Madam Caroline Sokoni is just acting as you may be aware that the office of the Investigator General was transformed into Public Protector under the amended constitution. So Madam Sokoni was Investigator General, ” the source said. One official said Edgar Lungu may be scared because the Public Protector once appointed will not be reporting to the President but Parliament. “The new arrangement is that the Public Protector will be reporting to Parliament and not the President and that is the worry for him because there is rampant maladministration under the Patriotic Front. The Public Protector’s role is to investigate maladministration not corruption or abuse of authority which falls under the Anti Corruption Commission,” the source said. According to officials, another reason Lungu may be dilly dallying in appointing the Public Protector is because his or her findings and recommendations will be final. “It will be like a court verdict. What is more interesting is that hearings by the Public Protector can be heard in public like Parliament. This is all worrying to Lungu,” the source said.